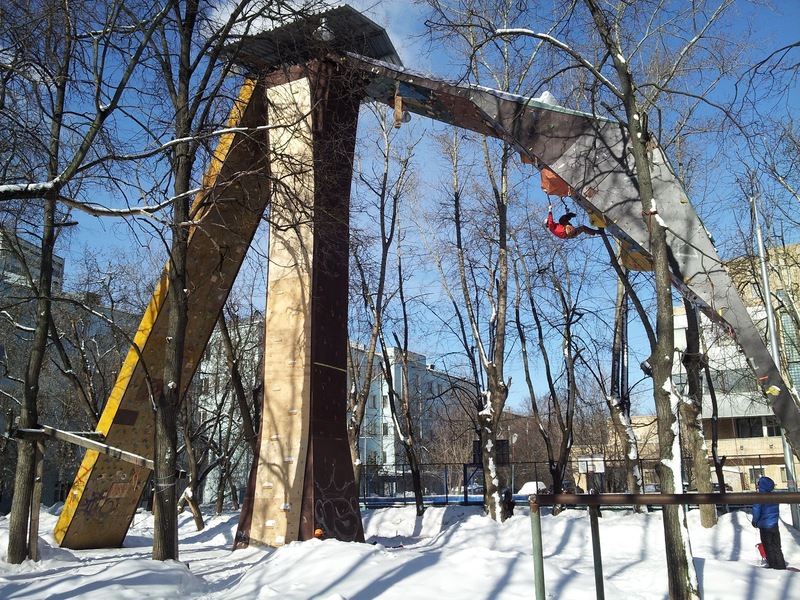 Training at the Moscow climbing structure. I feel like I lost another day of my life. I left home Saturday afternoon and arrived at where I'm staying in Moscow around 8pm on Sunday. It was only 11 hours of flying, but the layover and 9 hour time difference really ate away at the time. 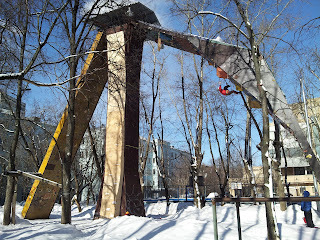 Today Pavel, Gord and I went to the Moscow climbing structure and did some training. Via subway and some walking its about an hour to get there from where we are staying . Most of Moscow can be easily traveled by an extensive subway system. The structure itself is in a park and is surrounded by apartment buildings. It is open to the public for a nominal yearly fee and in the summer its used for rock climbing. 11 hours. I had 7 hours of travel today and only went 1100km, not halfway across the world! Go crush in Russia.